Why doesnt google make an easy way to attach data to a country outline. I would love to have a layer which allows you to click on each country and it pops up a window showing overall country stats such as population GDP etc as is common in most large atlases.This could be done for cities and towns as well. Timothy, Google makes it easy to add other data in Google Earth. Try out the World CIA Factbook in GE, or this huge collection of GIS information (including world-wide populations). Thank you for the links, they are very interesting. However the data is displayed using downloaded pictures. It would be nice if one could write a kml which say specified the colours to display different countries in or specified new data to display when someone clicks on a city, town or country. 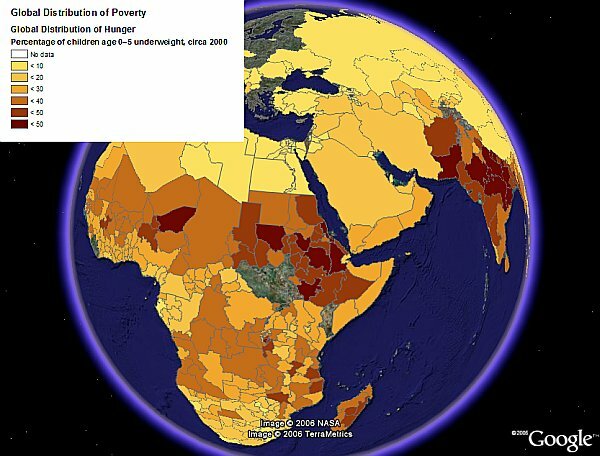 By the way the global hunger map in your blog entry just shows a white globe on my system. I am guessing it is something to do with the capabilities of my graphics card. More than 110 million school-aged children in the world's poorest countries suffer from hunger. The vast majority of them do not attend school. This is an unnecessary and preventable tragedy. The George McGovern-Robert Dole International Food for Education and Child Nutrition Program provides meals in schools to some of these children. But there are many more that go to bed hungry. Bipartisan legislation was recently introduced in Congress to expand the McGovern-Dole Program so that more children can attend school and be guaranteed at least one nutritious meal per day. Help expand the George McGovern-Robert Dole International Food for Education and Child Nutrition Program. Sign the petition.